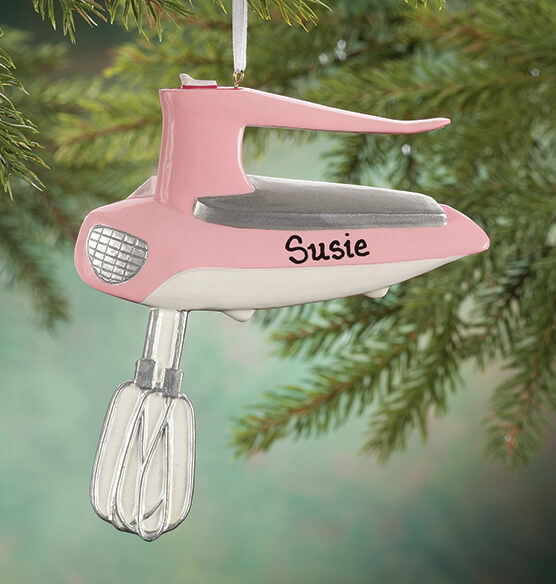 This personalized hand mixer ornament mixes style with a dash of sweet sentiment—naming one special cake maker, cookie baker or whipped cream wiz! Artfully designed with a touch of retro charm, our exclusive ornament is wonderfully detailed in handpainted resin. We'll hand personalize at no extra charge, creating a one-of-a-kind holiday Christmas ornament. Specify name; limit 1 line, 12 letters/spaces. 5" x 4 1/2". I'm saving this to give to my Son. He loves to cook. It will look GREAT on the Christmas tree. My granddaughter wants to have a bakery after she graduates. This was the perfect ornament for her!!!! Each year as our children get older I am running out of ideas (she is 58) and she loves to bake so when I saw this mixer ornament it was just right.